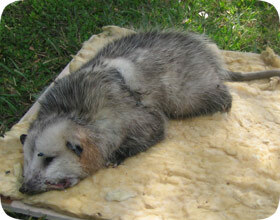 We are experts at finding and removing dead animals - we get rid of the stench for you! We do the dirty work! Dead animal removal, especially from inside of a home or building, is an art - I mean it. It's often very difficult to find and remove the deceased critter. It might have died in some hard-to-reach corner of the attic, under the insulation, or perhaps it's fallen down a wall somewhere. We've been to many homes and buildings in which people have tried for days, and have called out other less competent companies to search for the dead critter, and we are the only ones who can find it. If you have a horrible stink in your house, there's a good chance that it's a decaying wildlife carcass. Rats die inside homes all the time, as do squirrels. Raccoons, opossums, and skunks often die on the property or under a porch or shed. We sniff out the animal and do whatever it takes to remove it. We decontaminate and deodorize the area, and provide relief from the terrible odor. Hi, Caring for the house of an elderly friend and thought it smelled funky - but not horrible. Went into the basement where no one had been for months and discovered a dead raccoon under the stairs. Looks to be an adolescent - not a baby or a large mother. My question - can I just pick it up, with gloves and shovel, of course, and place it in a bag and throw it in the garbage? Then I would think about bleach for the spot? I guess I'm worried about diseases of any kind. Animal control charges a lot to come out and remove the animal and doesn't do any clean-up. Obviously the next step is to close off the access to the basement after checking for any other raccoons, but first things first. Thanks for your help?